Indy Eleven walk tall after a 2-1 win against Nashville SC in their second home appearance of the 2018 season. Both sides remained tame within the first 10 minutes of play as the teams sought to feel out their opposition, but the tides turned in the 15th minute after Indy opened the score line. From deep in Indy’s defending half, Eleven midfielder Ayzoe Garcia Perez volleyed the ball just over the far edge of the center circle and through Nashville’s defensive line, allowing Indy forward Soony Saad to collect and fire a shot 12 yards out to open his 2018 scoring account. Indy would double their lead nearly 15 minutes after their first with another strike from Saad. The Dearborn, Michigan native gathered his second after “Indiana’s Team” was awarded a free kick nearly 30 yards out and slightly left of Nashville’s goal. “Boys in Blue” striking partner Jack McInerney ran up to take the kick, but pulled back at the last second to push the ball slightly to the right, where Saad carved the ball up and over into the right side of the net. Nashville began asking questions at the end of the first half. Nashville captain Michael Reed ran deep along the left edge of Indy’s 18 yard box before making a cut back around Eleven defender Brad Ring for his shot. The ball curled towards the center of the goal to test goalkeeper Owain Fon Williams, but the attempted smacked the crossbar and landed out of play before the Welshman could get a glove on it. The two goal differential was short lived, though, as Nashville pulled one back at the end of the half. Nashville’s Ropapa Mensah registered the visitor’s only goal as midfielder Lebo Moloto sent a pass back from the edge of the field to the center of the box to the waiting forward, gliding underneath falling Indy Eleven defender Carlyle Mitchell. 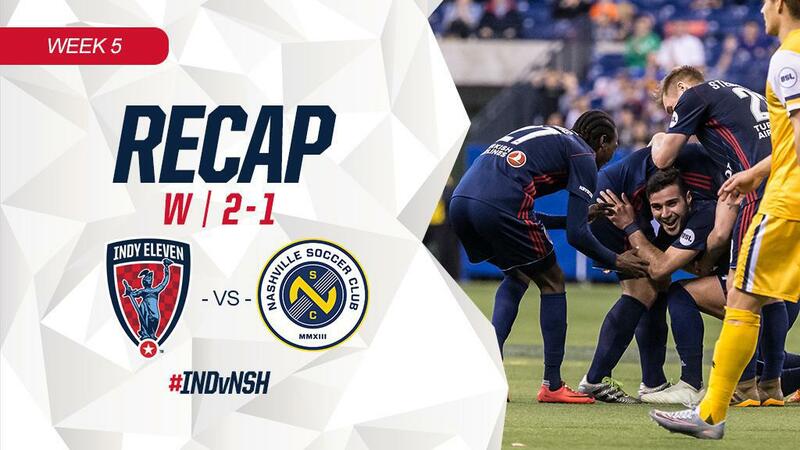 Indy made one more solid run in the 80th minute when Eleven midfield duo Matt Watson, who entered the match in the 68th minute, and Tyler Pasher charged through the top of Nashville’s box. Though they each fought for a shot, the midfielders couldn’t find a clear opportunity before getting tangled with Nashville’s defense and forcing the ball from play. While both sides fought for chances back and forth in the final 45 minutes, neither side could muster another goal. The “Boys in Blue” came away with three point as the 90 minute bout came to its conclusion. Indy Eleven now sits in third place in the USL Eastern Conference on goal differential alone, tying with defending 2017 USL champions Louisville City FC and former NASL mainstays Tampa Bay Rowdies with nine points each. “Indiana’s Team” enters another bye week in Week 6 before hitting the road to take on Charlotte Independence on Saturday, April 28, at 7:00 p.m. ET. The following week, FC Cincinnati return for another home clash on Wednesday, May 2, at 7:00 p.m. and Louisville City FC just three days later; May 5, at 12:00 p.m. Tickets to these matches can be purchased online for at low as $15 at www.IndyEleven.com or by calling (317)685-1100.